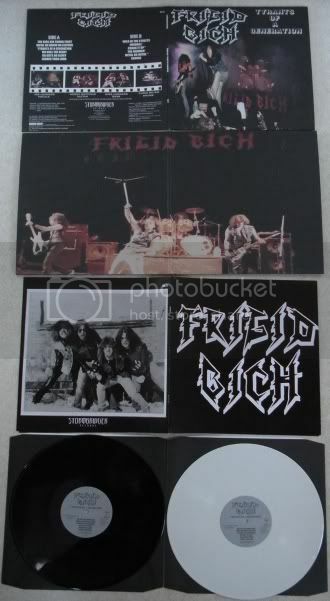 Thought I should let you guys know that the Frigid Bich record is now available. Unfortunately the band wanted cash instead of copies of the record, so it'll not be available from them like the Boss Tweed record I did earlier this year. It weighs more than a double album so it'll cost a fortune to send outside Europe, but maybe some of you who are interested in this can get get it from any of the distributors here in Europe. High Roller already have copies in stock. Most likley I'll send Mike from Maniacal Records a few copies in the near future, so he should have a few for sale eventually. This includes various recordings with the 2nd line-up of the band (1983 - 1986). Some of the bonus live tracks (covers of Motörhead, The Rods & Anvil) are sourced from a previously uncirculated soundboard live tape. If you're only familiar with the early stuff they did (the self-released 45 and the 10" OPM did) then you should know that the later stuff is a lot more aggressive sounding. Absolutely top notch stuff if you ask me. Some of these songs are posted on You Tube if you want to check them out. I first got in touch with singer Joe Leonard about doing this record as soon as I found out OPM weren't going to do anything with this material. For some reason it took some 7 - 8 years before it finally happened. 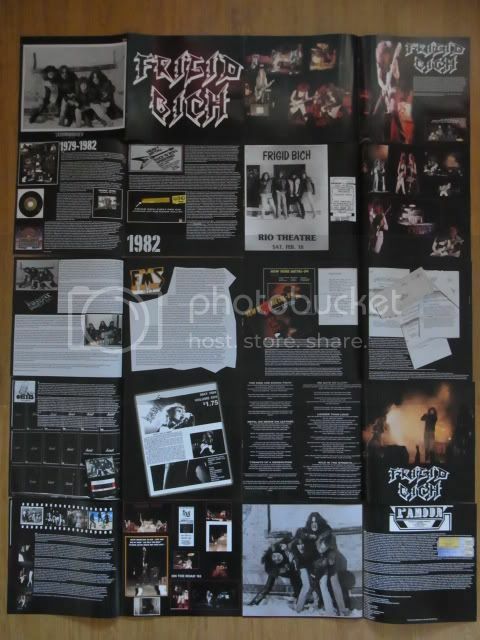 Comes with a gatefold sleeve and a thick 20 pages full color booklet with in depth liner notes by Joe and lots of old photos, tickets, posters etc + lyrics. 500 copies pressed - 250 on black vinyl and 250 on white. Next up on Stormbringer is the 3 LP box with Black Hole. All tracks will be re-mastered for this release, so it won't be the same versions that are on the CD box Area Death did. It'll also include lots of previously unseen photos! METAL ON DENIM ON LEATHER, LONG HAIRED PUNKS BANGING THEIR HEADS!!!!!!!!!!!!!!! Absolutely crushing band. Will there be a CD issue? Will buy a copy for sure! Very nice. Shame about the US distribution, will probably end up grabbing it from HRR. No idea when it comes to a possible CD version. Filippo from Area Death approached me about it a while back, but since he's no longer involved with that label I doubt they'll ever do it. Shadow Kingdom was also interested at some point but I haven't heard from him in a long time. Yeah, it's a shame that I'll have to charge a fortune for copies to distributors overseas. I don't know how much they charge for records in Japan, but there are always a few distributors there who buy copies from me no matter what. This record cost me a lot of money to press (just the booklet was something like 4 Euros each) + I paid the band $1000 just to be able to it. I sent Joe from the band something like 25 copies the other day and I had to pay almost $200 in postage - Swedish postage rates are insane! Like I mentioned earlier, I hope to be able to work out a trade with Maniacal Records for some copies. Also, Buried By Time & Dust have gotten in touch with me about getting copies. I usually try to avoid trading as much as possible, but since both these labels release stuff I need myself I could use copies of some of their releases. So hopefully some copies will eventually make it over to the US for decent prices. Distributors in Germany that usually carries copies iof my releases are High Roller, Iron Bonehead, Hell Bent For Records, Metaleros, Underground Power etc. I've been looking forward to this LP for awhile. Please update this thread with any U.S. distribution information if/when it becomes available. It seems like something Shadow Kingdom would distribute. yeh i emailed maniacal as soon as this thread came up, just ordered the HELLION lp from him! Yeah this record has to make it to these shores some way or another....i would hate to shell out big bucks to buy one from high roller or whatever. Hopefully maniacal and or bbtad saves the day pal. edit: just checked the shipping via HHR. its more then the actually LP! hey NWNPROD, any chance you will get a batch of these wholesale? i dont see why they wouldnt sell even with a hefty price tag.. the bbtad releases seem to do fine. I'm gonna get in touch with Mike from Maniacal again as I need some copies of the Hellion record. I'm currently discussing a trade with Russ from BBTAD., so he should have copies in the near future. good to know that the trading wheels are in motion for this killer release. i got a half a case of southern tier pumpking ale and a bottle of silver patron to toast once its on my record player pal. Please use a different cover artwork than the triple CD. I can't wait for this one. Hahaha I emailed him exactly the same thing! any updates on usa trades pal? will probably order from Europe if I don't see anything for sale at a lower cost in Canada/USA.